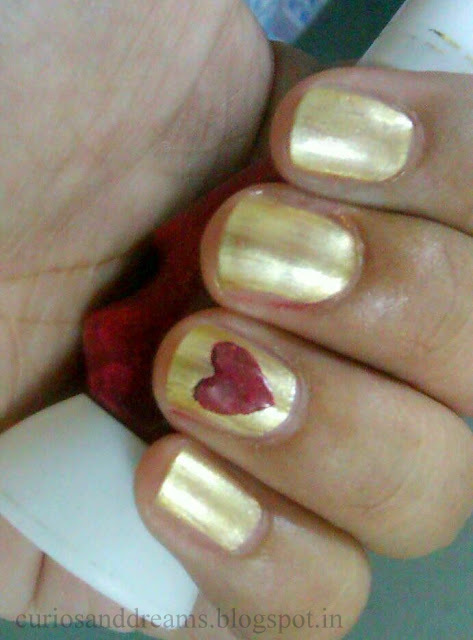 So with the 14th being just a day away, love is going to be all around us.... Why not show it off on your nails too? If you have the time try this one. Its easy and super fast. Now that you have your products assembled, let's begin! ● Give yourself a mini manicure.. you wouldn't want dry cuticles and rough nail edges now, would you? ● Paint your nails with the red nail polish (used elle 18 nail pops in 38). This will be your base colour. Ideally do this the night before so that it dries properly and the tape doesn't cause any damage nor are you left with any fabric impressions. Skip the top-coat for now. ● Now take a piece of scotch tape and fold it into half. Take care to not stick the ends together, or it becomes a real pain to un-peel them (trust us). Draw half a heart shape on the folded edge and cut it out using a small sized scissors.When you unfold the tape strip, you'll get a perfectly shaped heart. 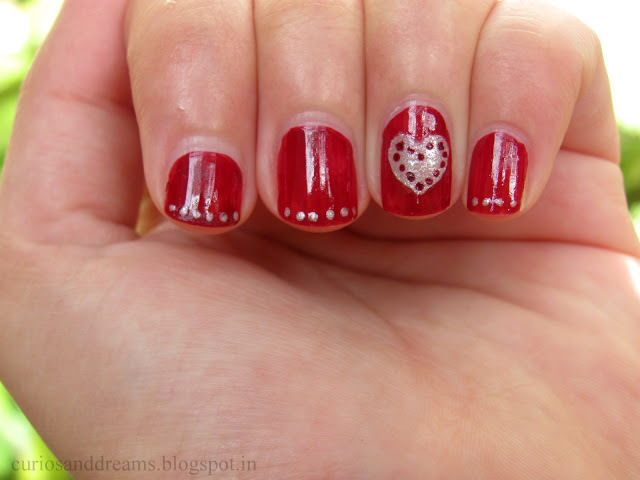 Make the size of the heart according to your nail length and size. ● Make the tape less sticky by blotting it against your finger or palm a few times. ● Stick the tape securely on the nail where you would want your heart to be. ● Let the gold paint dry slightly and gently peel off the tape strip. Be careful and slow so that the edges do not get damaged. They are quite prone to distortion. If at all the edges get pulled away slightly, use your pen tip to gently push it back into shape. You can also add a layer of glitter over the heart before peeling the tape off for added bling. 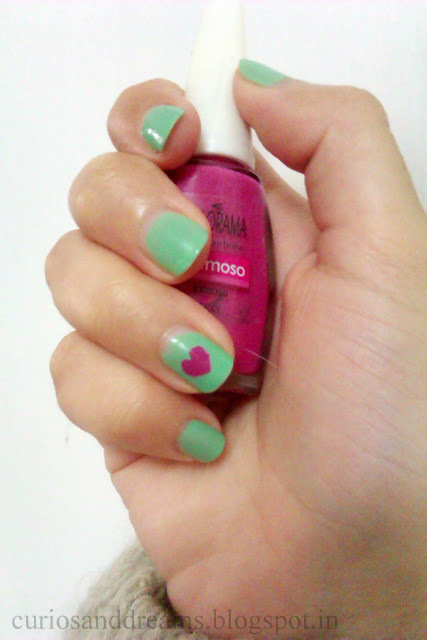 ● If you'd like to take it a step further, use the brush of the accent nail polish to deposit a blob on the pen tip. Use the pen to dress up your remaining nails with dots. Choose whatever pattern that appeals to you! 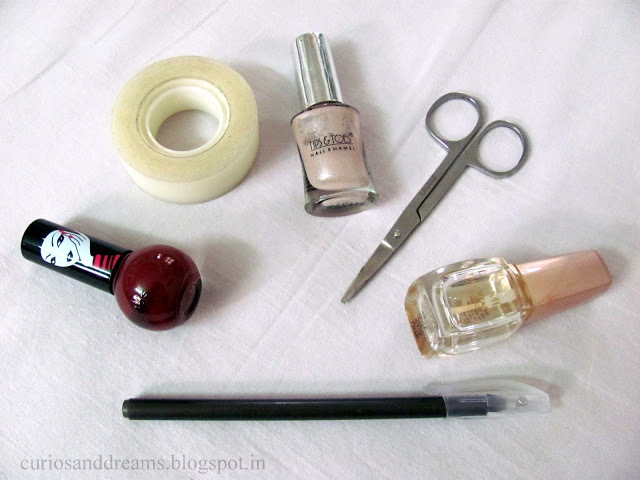 ● Seal everything with a top coat (used Lakme true wear nail colour classics in Clear Glass). Let it dry completely. Go ahead try it out! Thank you so much! We're glad you liked it, and that you stopped by our blog :) Welcome to C&D!